Station staff at Heathrow are gearing up to defend Harvinder Billing, a colleague sacked after two ticket office discrepancies. Anyone who works in a ticket office knows how unreliable LU’s machines can be. We can’t stand by and watch our colleagues sacked for human error on an unreliable system on which we’re not properly trained. It’s good to see Harvinder’s colleagues rally round. Read more about Ballot for Billing! Management wanting to impose new rosters on Picc Line drivers at Bollo House depot in Acton? Wouldn’t have thought so. RMT members are preparing a ballot to resist the imposition. Let’s see how the bosses' roster looks with all the drivers on strike. Arnos Grove station staff are shocked and angry that management have suspended a workmate for a minor ticket office discrepancy. The staff member concerned has more than fifteen years on the job and six years doing ticket office duties without any problems, and yet the company has thrown the book at him over a shortfall that may not even be his fault. 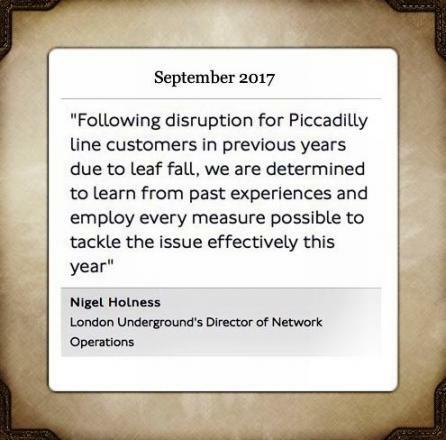 The Piccadilly Line has recently faced extensive delays due to “flatted wheels” a problem that caused major issues in 2015 and 2016 and resulted in a formal investigation and an extensive report from London TravelWatch. You can read what London Underground had to say about it here. Read more about Wheely good service? Action brings management to the table but where next? The Picc line strike 26-28 September was rock solid at all depots. Management are clearly worried and now asking to return to ACAS for further talks. Aslef members respecting pickets and the involvement of the night tube for the first time show there is appetite from drivers to pile on the pressure. Read more about Action brings management to the table but where next? Drivers on the Piccadilly Line are set to strike for 48 hours from 26-28 September, with Night Tube drivers striking on 28 and 29. Read more about Picc-et Lines! These strikes have been called in response to LU reneging on the agreements it made in July, which led to RMT calling off strikes planned for 11-14 July. Since then, Piccadilly Line bosses have failed to maintain staffing at the levels set by those agreements. 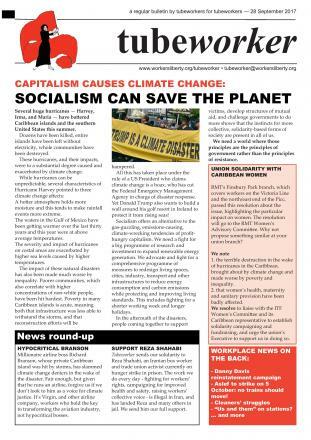 Read more about Picc Strikes Back On! Drivers’ strikes planned on the Picc for 12-15 July were suspended after bosses offered RMT a settlement. Among other things, the deal commits management to maintaining existing staffing levels at Picc depots. The big majority in the ballot for strikes shows the strength of feeling on the line. The strike was only suspended: the dispute remains live. If there’s even the merest sniff of management reneging on their commitments, new strikes should be called. All out on the Picc! RMT has named dates for a forthcoming drivers' strike on the Piccadilly Line. The strike begins at 21:00 on Wednesday 11 July, and finishes at 01:00 on Saturday 14 July. This will see four days of impact on the service, with two full strike days, and will also involve Night Tube drivers as it covers their Friday night-Saturday morning turns. The strike also coincides with the visit to the UK of the far-right US President Donald Trump. We don't imagine Trump was planning on using the Picc too much, but if the strike disrupts his visit in any way then that's an added bonus! Read more about All out on the Picc!